Today's card isn't from a sketch or for a challenge. It's just a simple one that I created using the sentiment as the main focal point. I like to have cards on hand to send to friends just because, and I think this one will go in that stash (or at least be the first one in that "stash"!). So, to anyone who is viewing this post, this sentiment is for you! 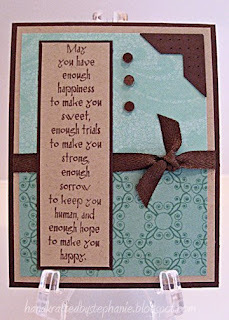 Cardstock: CTMH, PTI (Dark Chocolate, Kraft); Patterned Paper: K and Company; Stamps: Verve (Filigree), CTMH (sentiment); Ink: , CTMH, Memento Rich Cocoa; Photo Corner punch; paper piercer; Twill ribbon (reasonableribbon.com); Bella dots.